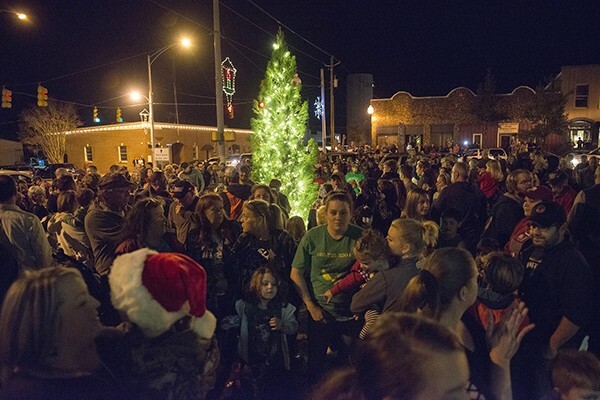 Huge Crowds Turned Out for Leeds Downtown Christmas Tree Lighting | The Christmas season was kicked off this year in historic Downtown Leeds on the Parkway with a Downtown Christmas Tree Lighting event that brought huge crowds to the streets on Thursday evening. 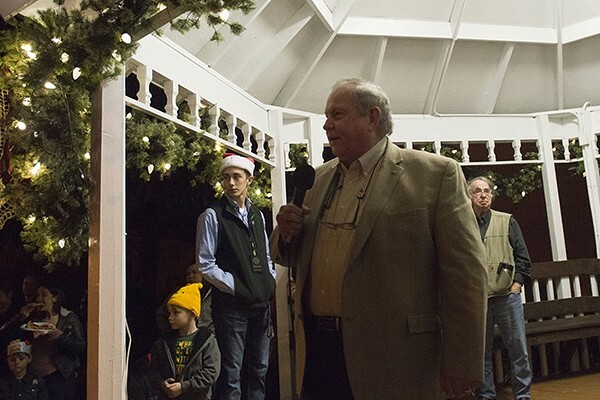 The welcome and tree lighting was presented by Mayor David Miller. 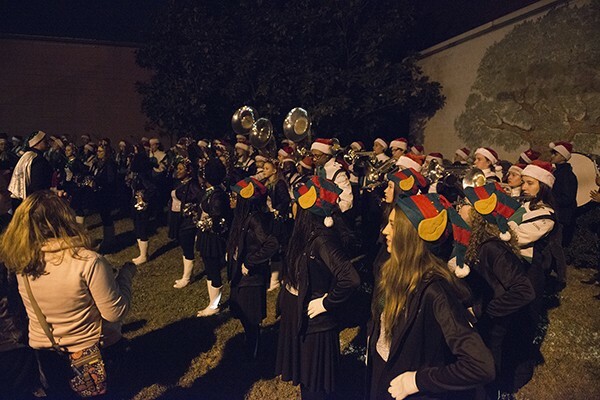 Leeds High School Band played Christmas music for everyone to enjoy. Leeds Theatre and Arts Center was open to provide hot chocolate and coffee provided by the Leeds Arts Council. Pazzo Pizza and City Bowls food trucks were on the streets. Santa arrived for selfies with the children under the gazebo. Local retailers stayed open late for the convenience of shopping and the weather was absolutely perfect. It was just an awesome night of community to celebrate the holiday season together. This event was made possible with a partnership between the City of Leeds, Leeds Redevelopment Authority and Leeds Area Chamber of Commerce along with community sponsors. Lehigh Cement Company donated the Christmas tree, Bass Pro Shops donated the garland and wreaths, Leeds High School Band provided the music, Johnny Warren and the City of Leeds workers planted the tree and decorated the gazebo and grounds surrounding the area, Revocation Radio provided the sound system and additional music, Dona Bonnett provided the publicity, photos and videos. Sandra McGuire and the Leeds Area Chamber of Commerce coordinated the event. Estimates are that there were close to a thousand or more who attended and most people hung out for over an hour enjoying all of the festivities and a sense of community. Plans are to make this an annual event. 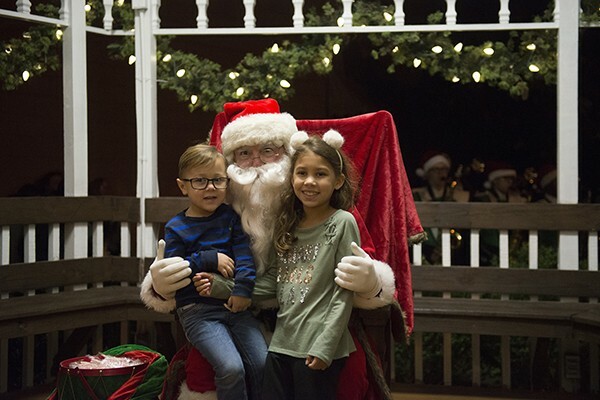 A Downtown Christmas Open House is planned for this Thursday, December 6 from 5:00 p.m. until 8:00 p.m. and the Leeds Christmas Parade is scheduled for Friday, December 14 at 7:00 p.m.
Other city and chamber events that were added this year to the downtown area include the Leeds Carnival and a Homecoming Tailgate Event. In 2019, the Leeds Fall Festival and John Henry Celebration has been scheduled for Saturday, September 21 so mark your calendars to attend. For more information about these events, please contact Sandra McGuire at (205) 699-5001 or visit www.leedsareachamber.com or www.EveryoneLeeds.com. Note: Photos and video clips that were taken at the event may be viewed at the Leeds Area Chamber of Commerce Facebook page. Please feel free to Like, Comment and Share.